In this tutorial, we will Interface a Capacitive Touchpad to Raspberry Pi. Capacitive Touchpad has 8 keys from 1 to 8. These keys are not exactly keys, they are Touch Sensitive Pads placed on the PCB. When we touch one of the pads, the pads experience the change of capacitance on its surface. This change is captured by the control unit and control unit, as a response, pulls a corresponding pin high at the output side. We will attach this Capacitive Touchpad Sensor Module to the Raspberry Pi, to use it as input device for the PI. 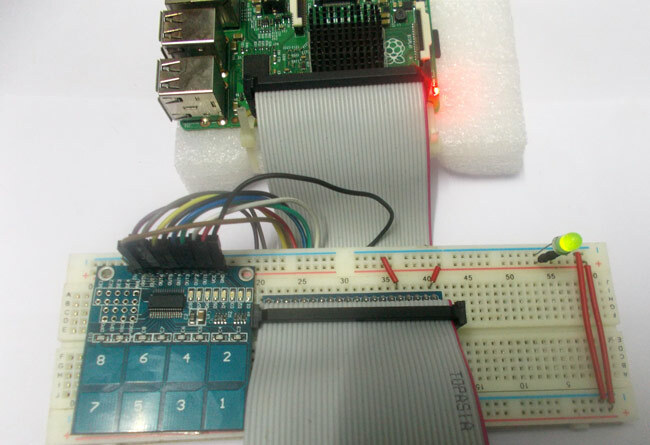 We will discuss a bit about Raspberry Pi GPIO Pins before going any further. As shown in above figure, there are 40output pins for the PI. But when you look at the second figure below, you can see not all 40 pin out can be programmed to our use. These are only 26 GPIO pins which can be programmed. These pins go from GPIO2 to GPIO27. These 26 GPIO pins can be programmed as per need. Some of these pins also perform some special functions, we will discuss about that later. With special GPIO put aside, we have 17 GPIO remaining (Light green Color). Now another important thing here is that, PI logic control is of +3.3v, so you cannot give more than +3.3V logic to GPIO pin of PI. If you give +5V to any GPIO pin of PI, the board gets damaged. So we need to power the Capacitive Touchpad by +3.3V, for getting proper logic outputs for PI. The connections, which are done for Capacitive Touchpad Interfacing, are shown in the circuit diagram above. We are setting 8 pins as input pins. We will detect 8 key outputs from Capacitive Touchpad. In case the condition in the braces is true, the statements inside the loop will be executed once. So if the GPIO pin 21 goes high, then the statements inside the IF loop will be executed once. If the GPIO pin 21 does not goes high, then the statements inside the IF loop will not be executed. Once we write the below program in PYTHON and execute it we are ready to go. When the pad is touched, the module pulls up the corresponding pin and this trigger is detected by the PI. After the detection, the PI prints the appropriate key on the screen. Hence we have Interfaced Capacitive Touchpad to PI. IO.setup(21,IO.IN) # initialize GPIO Pins as an Input.